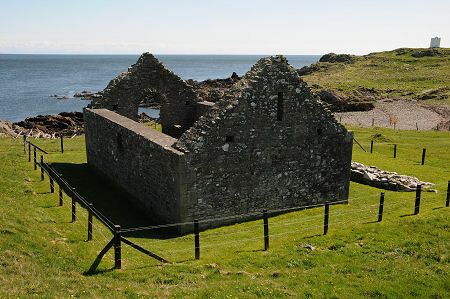 The substantial ruins of St Ninian's Chapel stand on the seaward side of Isle of Whithorn, on what was originally a genuine island before the gap between it and the mainland was filled during the development of the village and harbour. The chapel and the surviving part of the enclosure wall date back to about 1300. 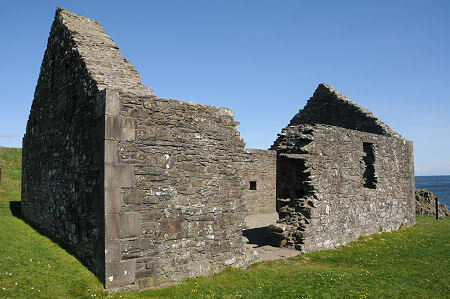 It seems to have been built on the site of a narrower chapel dedicated to St Ninian in the 1100s, but while it is tempting to think of the possibility of older structures which take Christianity here nearer to St Ninian's own time, seven hundred years earlier, no evidence for this has ever been found on the Isle of Whithorn. St Ninian's Chapel seems to have served as a first port of call for pilgrims who had landed from boats in the neighbouring bay. They would have come to the chapel to give thanks for a safe journey, in an era when travel by sea was always a lottery, and then set off on foot to cover the 3½ miles to St Ninian's shrine at Whithorn. In 1864 it was recorded that the dressed stone facing the walls of the chapel had been removed by "a certain retired sea captain" for reuse in the construction of his nearby house. As a result it was in a fairly poor state when drawn by MacGibbon and Ross for their Ecclesiastical Architecture of Scotland, published in 1896. In 1898 the ruins were extensively repaired and partly rebuilt, leaving them much as you see them today. The walls are now substantially complete, save for a large hole where the south doorway would once have been, though rather wider than any doorway. The east wall is pierced by a large round arched window, which also shows in the pre restoration sketches. 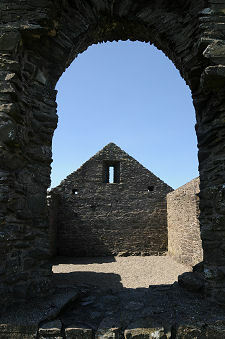 Other windows are smaller, and there is a square aumbry set into the north wall. A short distance to the south of the chapel are the remains of a broad wall. Though this seems rather massive for the purpose, it is apparently all that remains of the dry stone wall that would once have enclosed the chapel. You approach St Ninian's Chapel from the car park at the far end of Isle of Whithorn's harbour. En route you pass the walls that are all that remains of the village's old lifeboat station. Within them is the Witness Cairn, which since 11 May 1997 has commemorated the arrival of St Ninian in Scotland. Visitors are encouraged to add a stone to the cairn, and it is steadily growing over time. Also next to the path to the chapel is a beautiful Galloway granite seat which acts as a memorial to the seven local men who lost their lives in the sinking of the fishing boat Solway Harvester in a storm off the Isle of Man on 11 January 2000.